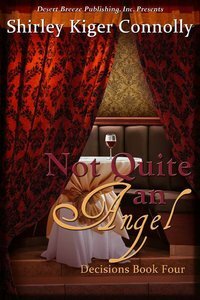 About "Not Quite An Angel (#04 in Decisions Series)"
A graduate of the Institute of Children&#039;s Literature, Shirley Kiger Connolly loves to wear different hats and use both sides of her brain. With her creative mind she pens historical fiction romances laced with nuggets of inspiration, and when wearing her thinking cap, she writes nonfiction devotional books. With a third trusty hat she hopes contains a bit of wisdom, Shirley teaches Koinonia women&#039;s bible studies and often speaks at retreats or luncheons. Outside her writing and speaking time, Shirley is an active mom and grandma who loves searches for different way she can rearrange her furniture, if she&#039;s not cross-stitching or doing needlework or watching old movies with her husband. As a part-time farm woman, Shirley spends some of her moments with her chickens, her dogs, and her cats. She stays active in American Christian Fiction Writers; Hearts through History Chapter of Romance Writers of America; and last but not least Faith-Hope-Love, RWA. Scorned with disgrace, Annabelle Jordan and her daughters are no longer welcome in her reverend uncle's community. In need of a fresh touch of grace, Annabelle's in no mood to seek mercy yet. Not after carrying on a youthful affair with that scoundrel of a boyfriend long enough to produce two daughters before she finally sent him away. Now without a home, Annabelle's convinced her answer is to find the man again and force that marriage he pledged but never kept. Annabelle knows he can provide her daughters the name, home, security, and future they need. Who else would show interest in a soiled, aging woman over thirty with two growing children? Clearly, that was before Major Carlton Radcliffe entered her life. How was Annabelle to know she'd fall for someone beyond her reach, loyal to the faith she's been fleeing and nobly pledged to a wife and family of his own?